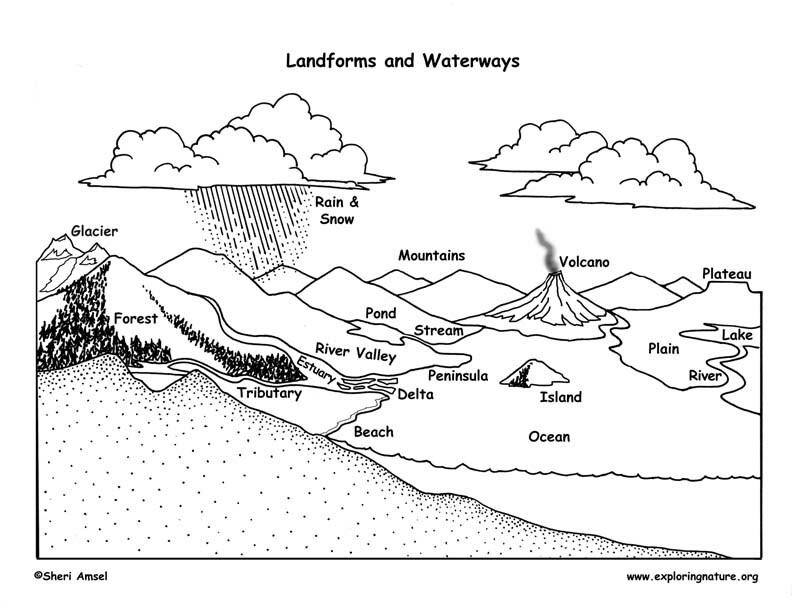 Landforms are kinds of topography - the natural features of an area - from mountains to plains. They vary greatly in shape, size and relief. Relief is the difference in elevation between the high and low point of a region. There are three main types of landforms – mountains, plains and plateaus. A region where the topography is made up of one main landform is called a landform region. Examples of landform regions are the Appalachian Mountains, the Steppes of Central Asia, or the Great Plains. Waterways are important for many reasons, but in relation to topography moving water is the force behind erosion, which shapes the Earth's varied landscape. 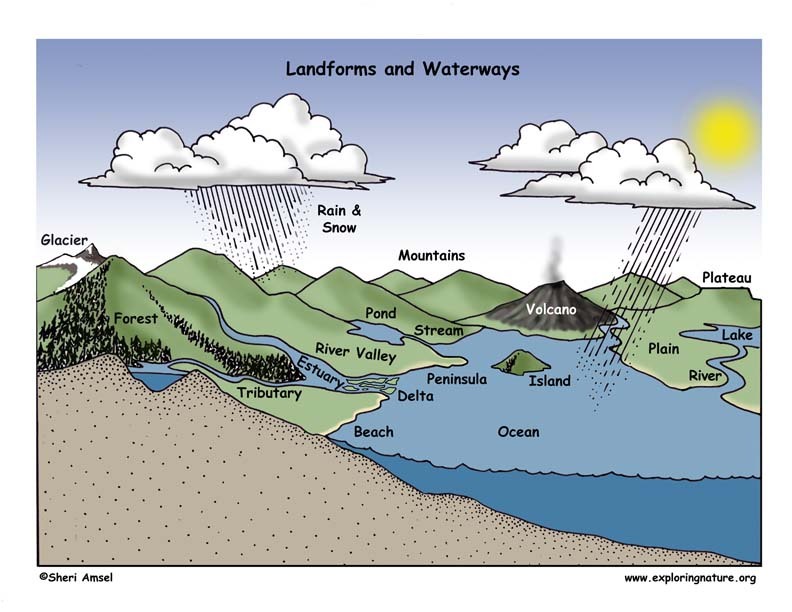 Rain and snowfall feed water into streams, rivers, ponds, lakes and oceans. The water also sinks into the ground, evaporates or is taken up by thirsty plants. When excess water – called runoff – moves over the land, it picks up soil and rocks and causes changes in the landscape though erosion. Water is a powerful force and over time can cut river valleys and canyons and deposit soil where the rivers meet the ocean – forming deltas. Grass, trees and shrubberies stabilize the soil and protect the land from too much erosion, but areas cleared of vegetation or too dry to hold vegetation are vulnerable to the effects of moving water. Archipelago: An Archipelago is a cluster or chain of islands in the ocean, such as the Galapagos or the Hawaiian Islands. Atoll: An atoll is a reef, which forms a ring of small islands on a coral base that surrounds a lagoon of water in an ocean. There are many atolls in the Indo-Pacific. Bay: A bay is a body of water formed by an indentation of land, but still connected to the main body of water (ocean or lake) and is smaller that a gulf, but larger than a cove. Beach: A beach runs along coastlines, lakes or rivers and is made up of sand, pebbles or rocks. Bluff: A bluff is a high, steep bank or cliff. Butte: A butte is a hill, with steep sides and a flat top that is standing out on its own. Canyon: A canyon is a deep slice of land that runs between two steep cliff walls, often carved over time by a river. Cape: A cape is a spit of land that extends out into the ocean or other bodies of water (i.e. Cape Cod). Cave: A cave is a naturally formed hollow underground. Channel: A channel is a deeper section of a river that is sought after by boats for passage or a narrow body of water that connects two large bodies of water. Cliff: A cliff is a vertical rock wall. Col: A col is the lowest point between two peaks. Continent: A continent is one of seven large landmasses on earth: Asia, Africa, North America, South America, Antarctica, Europe, and Australia. Cove: A cove is a circular coastal inlet. Delta: A delta is the mouth of a river where it meets a body of water, characterized by sediment carried down and deposited, making the waterway shallow and fanned where it enters the larger body of water. Dune: A dune is a hill of sand sculpted by the wind. Estuary: An estuary is a coastal area where a river or rivers meet the ocean and form a brackish water ecosystem that is influenced by tides and the sentiments brought downriver. Fjord: A fjord is a long, narrow inlet bounded by steep sides that was created by glacial activity. Forest: A forest is a large area of land covered in trees. Glacier: A glacier is a large mass of ice that moves slowly across land. Gorge: A gorge is a narrow valley that runs between two steep canyons, often carved over time by a river. Gulf: A gulf is a portion of the ocean that cuts into the land. Hill: A hill is a landform raised from the surrounding plain to a rounded summit and considered much smaller than a mountain. Island: An island is a land mass surround by water. Isthmus: A isthmus is a narrow piece of land that connects two larger landmasses and is surrounded by an expanse of water. Key (Cay): A cay is a small, sand island that forms on top of a coral reef. Lagoon: A lagoon is a shallow body of water separated from the greater ocean by coral reef, islands, shoals or atoll. Lake: A lake is a large body of water (larger than a pond) surrounded by land. Marsh: A marsh is a wetland that is characterized by non-woody plants (no trees), such as cattails, sedges and pond lilies. Mesa: A mesa is a large, flat-topped expanse of land, shaped like a butte with steep sides, but much larger. Mountain: A mountain is a large landform raised from the surrounding plain into a peak or peaks that form a range and created by plate tectonics. (i.e. Mount Everest is the tallest mountain on Earth). Ocean: The Ocean is the largest body of salt water on Earth covering ¾ of the planet. Peninsula: A peninsula is a point of land sticking out into and surrounded by water on three sides. Plain: A plain is a large flat stretch of land found along coastlines or between mountain ranges. Plateau: A plateau is a large level highland that is edged by a steep slope. Pond: A pond is a small body of water (smaller than a lake) surrounded by land. Prairie: A prairie is a flat, rolling plain that is covered in grass with few trees. River: A river is a large waterway that flows into a lake, river, wetland or the ocean. Sea: A sea is a large body of salt water that is partly or completely surround by land and may connected to the larger ocean. Sound: A sound is a large inlet of ocean that is bigger than a bay and is located between two landmasses (i.e. Long Island Sound, Puget Sound). Strait: A strait is a long, narrow waterway that connects two larger bodies of water (i.e. Strait of Magellan). Stream: A stream is a small waterway that flows into a lake, river, wetland or ocean. Swamp: A swamp is a wetland that is characterized by trees, shrubs and vegetation and has slow-moving and often stagnant waters. Tributary: A tributary is a river or stream that flows into a larger waterway. Tundra: Tundra is a cold, treeless plain covered in low lying plants (shrubs, grass, moss, lichens) found in the Arctic, Antarctic and on some high mountain habitats. Valley: A valley is a lowland between mountains that is a natural funnel for flowing rivers. Volcano: A volcano is a cone-shaped mountain that, when active, can spew ash, toxic gas, and lava down its slopes and across the landscape. Waterfall: A waterfall is where flowing water falls over a drop, which creates a vertical “fall” of water. Wetland: A wetland is a habitat that is saturated by water at certain times of year or year round. They can take the form of a marsh, bog swamp, or fen. Study the Landforms and Waterways below. Then test your knowledge by naming them in the activity sheet below. Scroll down to the PDF at the bottom for a printable version. 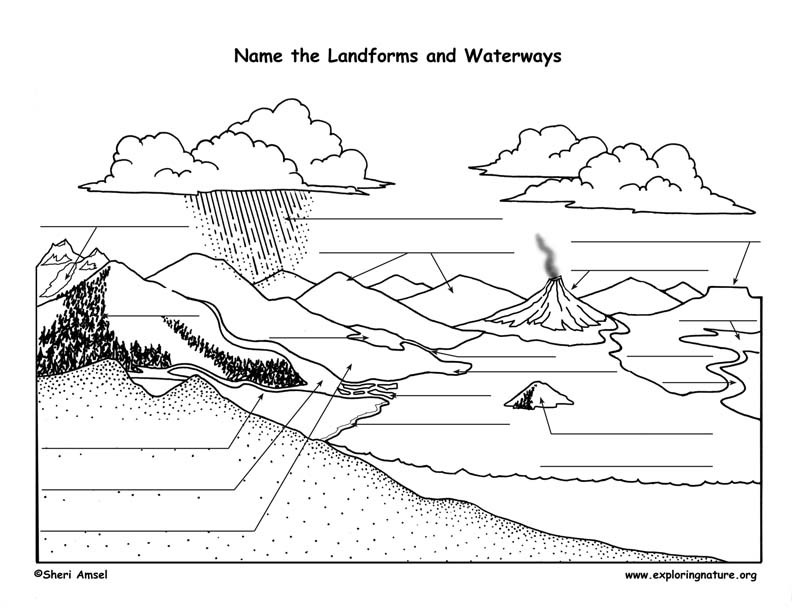 For more assessment, try the Landforms and Waterways Definitions Matching Quiz and the Landforms and Waterways Vocabulary Matching Quiz.